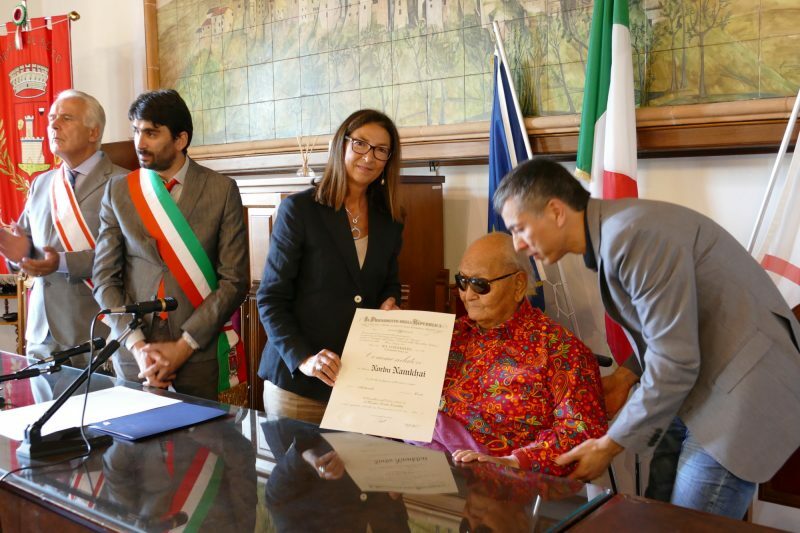 Master Namkhai Norbu Receives the Honor of Commander of the Order of Merit of the Italian Republic. 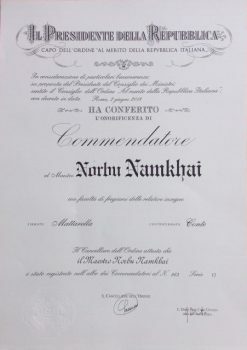 On 10 September 2018, in the Arcidosso Town Hall, the Prefect of Grosseto, Cinzia Teresa Torraco, conferred the honor of ‘Commander of the Order of Merit of the Italian Republic’ on Prof. Namkhai Norbu, for having dedicated his life to activities that have brought benefits to the community and the nation. In thanking Master Namkhai Norbu, who inspires an exemplary model of life and represents for all a living testimony of the highest human values, both ethical and cultural, the Prefect recalled the importance of honoring charismatic figures such as his, capable of inspiring virtuous actions and behavior with the strength of their example and with the values ​​of an authentic testimony expressed by life choices fully coherent with the thoughts of a noble and elevated nature. During the ceremony the Prefect underlined the fact that in view of the very high profile of his personality, the Presidency of the Council of Ministers had decided to directly confer recognition of the honorary title ‘Commander’, the highest honorary award of the Italian Republic. The ceremony was attended by the Mayor of Arcidosso, Jacopo Marini, and the President of the Regional Council, Eugenio Giani, in addition to the territorial authorities, the Mayor of Castel del Piano, Claudio Franci, the Mayor of Santa Fiora, Federico Balocchi, and the Prefect, Marco Valentini, director of the legislative affairs office and parliamentary reports of the Ministry of the Interior. in consideration of particular merits on the proposal of the President of the Council of Ministers, after hearing the Council of the Order of Merit of the Italian Republic on 2 June 2018, confers the honor of Commander on Master Norbu Namkhai with the right to wear the related insignia. At the end of the ceremony the Mayor of Arcidosso presented a banner to the Master to recall the importance of the Community of Merigar for the territory, while the President of the Council of Tuscany presented a second banner from the Amiata Municipalities. and reaffirmed the value of the honor of Commander from the President of the Republic in recognizing the spiritual and human values that Master Namkhai Norbu has brought to Amiata, recalling the strong spiritual energy of the territory. This entry was posted in Chögyal Namkhai Norbu and tagged chögyal namkhai norbu, dzogchen on 10 October 2018 by dzogchen.